Do Infants Get Ear Infections With Teething? Teething can be a tough time for a baby, forcing them to deal with a whole gamut of symptoms when their teeth are getting ready to erupt. Some babies end up with a little earache during this time. The pain from an erupting tooth can radiate to the ears and cause discomfort. Teething does not, however, cause an actual ear infection. Children younger than 2 years are much more likely to get an ear infection than adults because of the shape and size of their eustachian tubes. Bottle feeding, family history of ear infections and being in a group childcare situation are risk factors. Ear infections are also more common during flu season. Due to inflammation and fluid build-up during an ear infection, the confined space of the middle ear canal begins to hurt. These are usually caused by bacterial or viral agents. When the child has a cold, allergy or the flu, swelling of the nasal passages, eustachian tubes and throat prepares the scene for bacteria to gain access to the middle ear and cause an infection. Trying to decipher whether an ear ache is an infection or not can be hard for a parent, especially those with young children who cannot express what they are going through. If there is any doubt about whether you are dealing with an infection or not, always seek a doctor's advice. Meanwhile, there are a few things you can do to assess the situation. In general, teething is associated with mild symptoms. This is true for earaches associated with teething, too. The ear discomfort does not worsen when it is a result of teething. If there is severe ear pain with extreme fussiness or if there is any discharge from the ear, it is time to call a doctor. A child with an ear infection also experiences increased pain on lying down. The baby will usually refuse to lie down and your previously easy-sleeping baby will fuss while going to sleep. He may also show signs of a cold or cough. A fever above 101.4 degrees Fahrenheit also points toward something more than just teething. Ear infections due to viral causes usually resolve on their own. 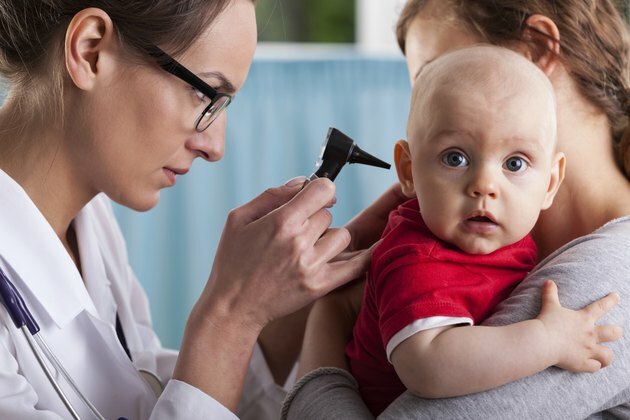 The pediatrician will monitor the ear infection to ensure that it does not progress or cause complications. If a bacterial agent is causing the infection, then antibiotics will be required. Pain is managed with painkillers, either over-the-counter or prescribed by your child's doctor. Most ear infections clear up quickly with appropriate care. But some long-standing or repeated ear infections can lead to hearing problems and problems with balance. Spread of infection is another concern. Speech delays can occur if there is temporary or permanent loss of hearing due to the infection. Hence, it is crucial to make the differentiation between a simple earache from teething and an ear infection, and get that infection cleared up as soon as possible. Call the pediatrician if you have any doubt about what your child might be suffering from.